Vijay hinted about converting his fans group Vijay Makkal Iyakkam into a political party.His father’s meeting with AIADMK supremo Jayalalitha at her residence in December added value the rumours. Ilayathalapathy Vijay has however clarified the rumours related to his political. His father says he would enter into politic after 40. The actor Ilayathalapathy Vijay has said that he will not enter now and he is concentrating only on his film career as of now. His father says he would enter into politic after 40. The actor Ilayathalapathy Vijay has said that he will not enter now and he is concentrating only on his film career as of now. The 36-year old actor Dr Vijay said that he will definetly enter politics some day and want to serve the people. Indian cricket captain Mahendra Singh Dhoni Married his childhood friend Sakshi Singh Rawat. This will certainly put an end to people linking me with him. Lakshmi Rai who was time and again linked with the smart cricketer and was perpetually involved in denying the link ups. I am very glad that my dear friend Dhoni is married now. She also added that she had known this little secret of Dhoni that he is seeing Sakshi and was on his way to announce his wedding. Lakshmi wished the couple a long and happy wedded life together. The Actor vijay's Sura film will be the hottest summer release and it making a big buzz as it was the Ilayathalapathy’s 50 th film. Vijay is teaming up with the hot and happening Tamannaah for the first time. Music of Mani Sharma has been well received in the market. Sura’s cameraman Ekambaram has said that the film has come out very well. Several scenes in Sura involved risky shots and it was possible to picturise it as the unit was very cooperative. The fight was choreographed by Kanal Kannan and has stuntmen from Bangkok. Ekambaram says that he has used high speed camera considering the risks involved in shooting in the seas. The complete film has been shot across the backdrops of beaches in Vizag, Kerala, Pondicherry, Tuticorin and other surrounding as the story revolves around fisherman community. Ekambaram reveals that one of the fight sequences, which were shot in the high seas in Tuticorin at 2 am, will be the highlight of the film. This summer is the hottest summer for vijay fans..
Soundarya Rajinikanth and Ashwin engagement was held at the Park Sheraton Hotel in Chennai on February 17th but the wedding date was not announced. High-flying VVIPs has been invited to the event. AIADMK General Secretary Jayalalitha and Chief Minister Karunanidhi has attended the event. Superstar Rajini’s youngest daughter Soundarya’s engagement has held in Chennai. In this ceremony Soundarya exchanging rings with groom Ashwin Ramkumar, son of popular industrialist Ramkumar. As of now Soundarya Rajinikanth’s wedding dates are announced. Soundarya Rajinikanth’s wedding with Ashwin will take place on September 2nd 2010. The venue for the wedding will be Raja Muthiah Hall in Chennai. 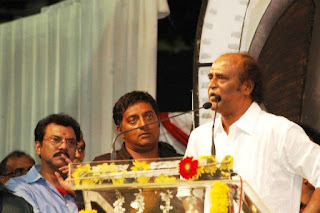 The elaborate thanksgiving event saw the entire Tamil film industry present including Rajinikanth, Kamal Haasan, Ajith Kumar and Vijay. The guest of honour was Bollywood’s great Amitabh Bachchan. In gratitude, for the land allotted in Kancheepuram for deserving members of the cine industry. Several top personnel, including actors like Vikram and Ajith came on stage to thank the CM for his support of the industry as a whole. 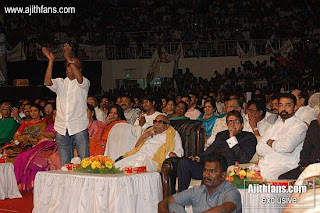 The Actor Ajith simply stunned the crowds with his speech. 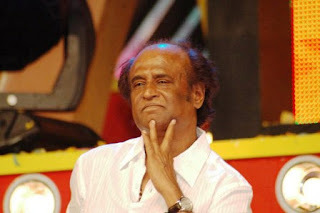 Rajinikanth stood up and gave Ajith a standing ovation, which resulted in the entire stadium applauding in uproar. Hi friends! This is my first visit to the theater for this year. This year i start with Aayirathil Oruvan movie. Actually due to over hype of this movie I have already booked the ticket in advance. I was very surprise to see actor karthik when I went to the theatre. About Movie, This movie is about the expenditure. The story was the expenditure of Missing Andrea’s father (Prathap pothan) and Missing pandian statues, which is consider as the assistors god. As they are on the way to expenditure they have to cross 7 traps like serpants, sea, kaattuvasis etc which they need to cross to go to the main place. The team was well aware of the problems and risks about the place they are travelling. The first half is superb. In second half the king sholan(parthiban) took the credits. He acted superbly along with reema sen. Overall the movie was good, excellent and superb. SelvaRaghavan has taken the movie to the next level even he took Tamil cinema to next level. Reema has done very god job in this movie. Full of double meaning dialogues and scenes which is Very entertaining for youths. r.parthiban’s, karthi, Andrea and reema acting another plus point. In second half we can get a Hollywood effect of movie. This movie has all sorts of ingredients to the audience especially for youth. Selvaraghavan makes the attempt to take the Tamil cinema to the next level. The World Bank Group president Robert Zoellick met finance minister Pranab Mukherjee. Mr Zoellick is in India on a four-day visit meeting key leaders including prime minister Manmohan Singh, finance minister Pranab Mukherjee and several other members of the Union Cabinet. He will also meet the CEOs of leading private sector companies. Mr Mukherjee appreciated the World Bank for its increased lending in the wake of the world financial crisis. At the meeting, Mr Zoellick sought India’s support in widening the capital base of the World Bank so that it could appropriately meet the needs of development finance. The request came after India agreed to invest $10 billion from its reserves to supplement the International Monetary Fund resources. Mr Mukherjee said India has been at the forefront of providing greater capital support to all the multilateral development institutions. Robert Zoellick on official statement said that the average commitment during the last four financial years from the World Bank has been approximately $2.3 billion. However, in the current year, the commitments are expected to reach about $7 billion. Mr Zoellick said up to $18 billion will be provided over the next three years by International Bank for Reconstruction and Development, $5-6 billion by International Development Assistance and $3.5 billion by International Finance Corporation.